We were all ready to put in new laminate flooring. As we pulled our carpeting up in preparation for our remodel we found beautiful (but weathered) hardwood oak floor. Needless to say, our plans changed. so we called him in to look at the floors and give us an estimate. 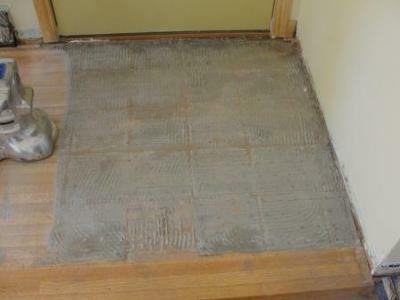 since the previous owners poured concrete on top of the hardwood to lay down tiles. Jerry gave us a very favorable estimate that we accepted. He was very honest about the entryway saying he would do his best, but could not make any promises. 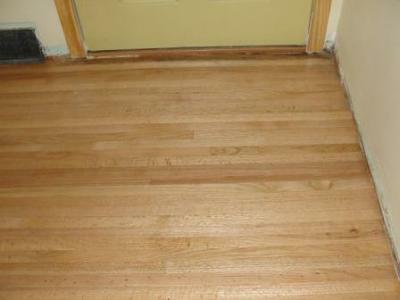 End results -- our floors are beautiful, including our entryway! We expected some blemish from the concrete, but there is none. There is no difference between this area and the rest of the floor. Jerry does great work and we would highly recommend him!! Thank you for the work and the kind words. When someone wants to refinish wood floors after a tile install, my concern is always the grout lines. so a VERY stubborn pattern results. In your case, however, I guess this old Floorwright was moreso. Like a lot of folks, you had a treasure under that carpeting. which usually isn't cheap, at all. I am happy for you and look forward to the next phase. but have extended my career.